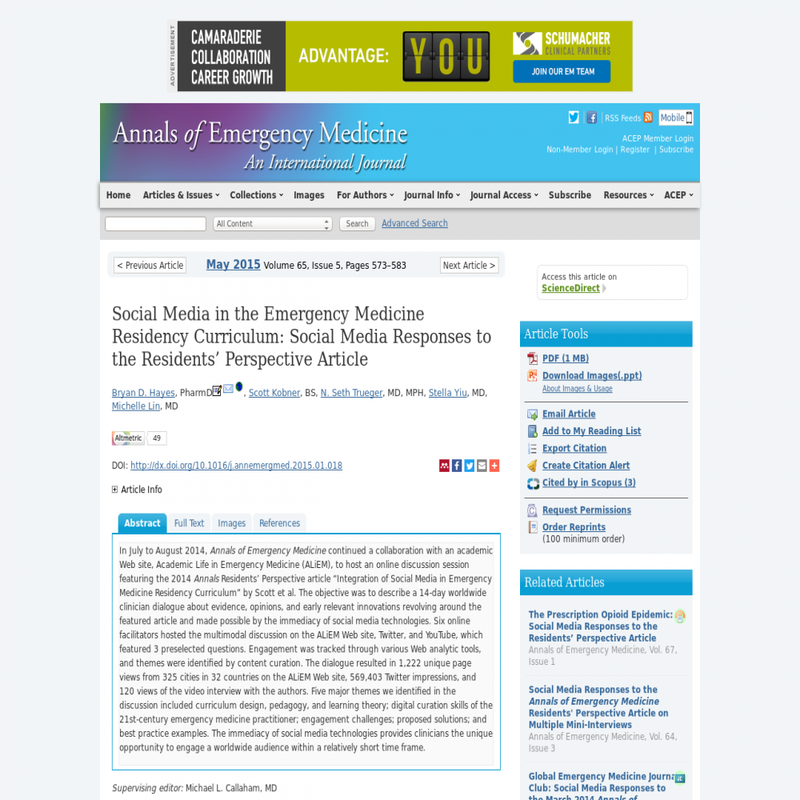 In July to August 2014, Annals of Emergency Medicine continued a collaboration with an academic Web site, Academic Life in Emergency Medicine (ALiEM), to host an online discussion session featuring the 2014 Annals Residents' Perspective article "Integration of Social Media in Emergency Medicine Residency Curriculum" by Scott et al. The objective was to describe a 14-day worldwide clinician dialogue about evidence, opinions, and early relevant innovations revolving around the featured article and made possible by the immediacy of social media technologies. Six online facilitators hosted the multimodal discussion on the ALiEM Web site, Twitter, and YouTube, which featured 3 preselected questions. Engagement was tracked through various Web analytic tools, and themes were identified by content curation. The dialogue resulted in 1,222 unique page views from 325 cities in 32 countries on the ALiEM Web site, 569,403 Twitter impressions, and 120 views of the video interview with the authors. Five major themes we identified in the discussion included curriculum design, pedagogy, and learning theory; digital curation skills of the 21st-century emergency medicine practitioner; engagement challenges; proposed solutions; and best practice examples. The immediacy of social media technologies provides clinicians the unique opportunity to engage a worldwide audience within a relatively short time frame.